Victor Fedeli was born in North Bay on August 8, 1956. He is married to Patty (Kelly), another North Bay native. His mother Lena still lives in North Bay. 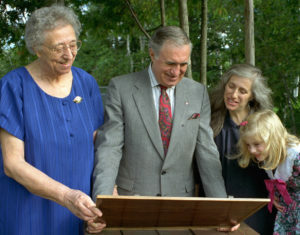 His brother Peter, wife Elizabeth, and their daughter Maggie also make North Bay their home. His sister Teresa and her family live in Montreal. After 5 years at Scollard Hall, Vic attended Conestoga College in Kitchener (and later Nipissing University), worked at an advertising agency in London, and moved home in 1978 to open his own wildly-successful company, Fedeli Advertising. Fedeli Advertising reached its pinnacle of success when it was announced that it was ranked 34th in the 50 Best Places to Work in Canada. (Cover is a mock-up presented to all recipients). “One of my goals was to make my company the kind of place where I’d like to work”, said Vic Fedeli. “It was difficult at first, but as the company grew, I wanted to share this success with our people.” Another great moment for Fedeli Advertising was when Vic Fedeli was recognized as one of Canada’s Most Successful Entrepreneurs, as Everett Banning interviewed Vic for his national radio show, MoneyMakers. Vic has a long and distinguished record of public service. On an international level, he has served as a Director of Global Vision. He has been a Director of the Province’s Northern Businesses Support System, and Ontario’s Northern Development Council. Locally, he was elected to 10 terms on the North Bay and District Chamber of Commerce, serving as President in 1986. He sat on most of the City’s boards and commissions, often as Chairman. The Queen’s Golden Jubilee Medal was awarded to Vic in 2002, and the Queen’s Diamond Jubilee Medal in 2012. They were awarded to those persons who have made a significant contribution to Canada, to their community, and to their fellow Canadians. When the Federal Government downsized CFB North Bay, the city turned to Vic to form Air Base Property Corporation. He worked as the Dollar-A-Year Chairman for seven years, until 2002. Successor Chairman David Butti presented Vic with 7 silver dollars; one for each year of volunteer service. He was named North Bay’s Citizen of the Year in 1999, the same year he was awarded Rotary International’s Paul Harris Fellowship in recognition of his community service. In 2003, as a first-time candidate, Vic ran for Mayor and was elected with a 75% majority. He was re-elected in 2006, with a 2nd landslide victory. In 2011, Vic ran as Ontario MPP for the riding of Nipissing, and won with a landslide. He was immediately appointed Energy Critic and was made Finance Critic in 2013. Vic won re-election in 2014, and again in 2018. While in North Bay, Prime Minister Paul Martin met with Vic at his home. For two hours Mr. Martin shared his thoughts with the invited guests (and enjoyed Patty’s cooking, as well as her humour!). While serving as a Director of Global Vision, Vic travelled the world sharing Canada’s philosophy on business. Here he shares the stage with the President of Taiwan’s legislature, Liu Sung-fan. As a result of his extensive travels, Vic has been working on a book, When in Rome – A Guide To Doing Business Around The World, about the cultural differences in various countries. Here he has an introduction to the Crown Prince of Dubai, His Highness Sheikh Mohammed bin Rashid Al Maktoum. As Mayor, Vic met former Russian President Mikhail Gorbachev during a Canadian Red Cross Power of Humanity dinner in Toronto, where Mr. Gorbachev was the keynote speaker. Afterwards the Mayor told him his speech was very moving and that the world acknowledged his remarkable successes. Mayor Fedeli had the great pleasure to meet with The Honourable Madeline Albright, former U.S. Secretary of State. Vic was one of two North American Mayors invited to the prestigious Government Leaders Forum, where all levels of government across the Americas met to discuss issues, hosted by Bill Gates. Vic made news on both sides of the border when he successfully launched a grassroots campaign to reverse the U.S. government’s Buy American provision. He invited every Canadian mayor to join him and spent months doing media interviews on both sides of the border. David Jacobson, then U.S. Ambassador to Canada, acknowledged this played a huge role in the successful removal of the Buy American restriction. 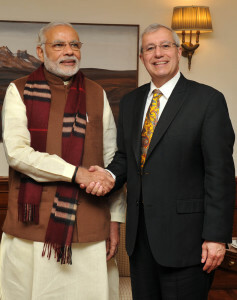 As Nipissing’s Member for Provincial Parliament, Fedeli met with Indian Prime Minister Narendra Modi to discuss opportunities for partnership in North Bay’s thriving film, technology, and aviation sectors. They also discussed shared goals with respect to successful economic development – namely cutting red tape, building infrastructure, and making hydro affordable. In 1992, Nipissing University embarked on their first-ever fundraising campaign to fund their expansion. They turned to Vic Fedeli to serve as one of the Chairs and lead the campaign. And lead he did. He made a $250,000 donation to fund the Vittorio Fedeli Business Centre, in honour of his grandfather. It was the largest donation the University had ever received, at the time. When Canadore College made the decision to construct their School of Aviation at the Airport, they also turned to Vic to Chair their fundraising initiative. To lead off the campaign, Vic donated $100,000 to construct The Hub, a 70-seat lecture hall, named after his father. A few years later, Canadore constructed their Centre for All Media and Vic quickly donated a further $100,000. He acknowledged that when he opened Fedeli Advertising he relied heavily on graduates from Canadore to staff his company. In 2009 Nipissing University and Canadore College came together to build The Mike Harris Learning Library. Again, Vic played a lead role by serving on their fundraising committee. He kicked things off with a further $250,000 donation and used that to leverage many other donations. The North Bay General Hospital fundraising campaign got a boost from Vic’s $150,000 donation. “I believe the new hospital is extremely important to the region. Not only will it provide a better level of care, but the construction and services required will be the catalyst we need to jump-start our economy”, said Vic of his donation. 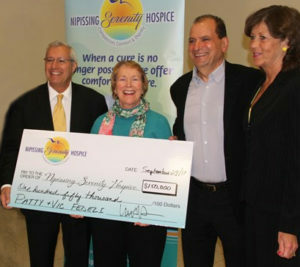 The Nipissing Serenity Hospice was very pleased to learn of Vic’s $150,000 donation to their fundraising initiative. “After watching a very close friend die a painful death, and more recently seeing another friend make a peaceful transition, Patty and I knew we had to give the Hospice the boost they needed,” Fedeli said at the announcement. During his terms as Mayor of the City of North Bay, Vic worked for $1 each year. His entire 7-year Mayoral salary of $350,000 was donated to charities, bringing his total local donations to $1.5 million. P.S. Vic is always seen in one of his trademark yellow ties!